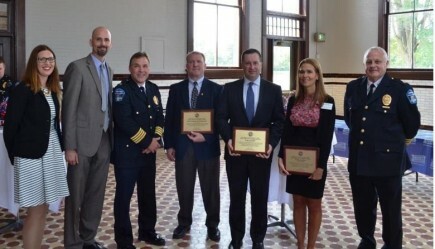 Butler University is the 2015 recipient of the Marion County Prosecutor’s Crime Fighter of the Year Award, presented on August 4 by Prosecutor Terry Curry to Butler University Chief of Staff and Executive Director of Public Safety Ben Hunter, Assistant Professor Brandie Oliver and Butler University Police Department Detective Bruce Allee. Speaking at the 32nd annual National Night Out Kick-Off and Crime Fighter of the Year Award Ceremony, hosted by the Indianapolis Metropolitan Police Department, Curry said Butler was chosen for the school’s work in improving the success of youth and families by addressing truancy, bullying, and through other crime prevention initiatives. In 2013, Butler University partnered with the Marion County Prosecutor’s Office to present the “End Bullying Now” forum. The event provided an opportunity for experts to educate parents, caregivers and educators on the educational, legal and psychological effects of bullying. Curry said his staff has utilized this information in the office’s outreach efforts with young people across the county, sharing solutions for prevention and intervention in bullying through the office’s CyberSafe program for students and their parents. Butler and Oliver have also been instrumental in efforts to address truancy in Marion County. Recognizing that truancy often is a result of other family issues, the Marion County Prosecutor’s Office set the goal of finding productive consequences for children who do attend school regularly and their parents. Oliver and Butler graduate students created and implemented a four-part parenting class that was court ordered as a condition of a diversion agreement for parents. Butler students also created and implemented a program for middle school students who were truant from school. 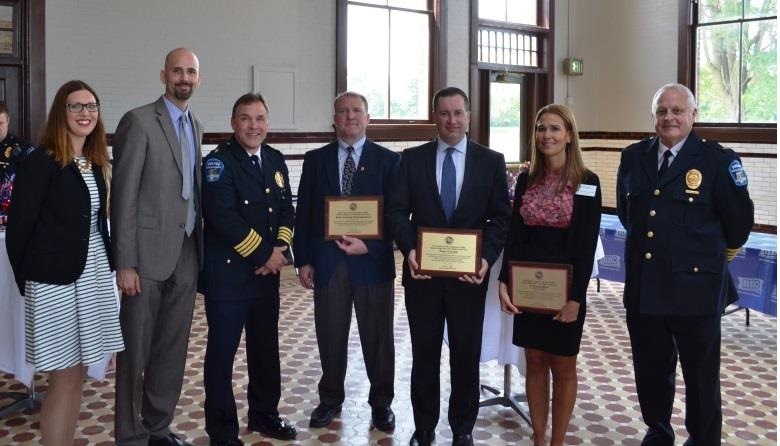 Butler University Police Department was recognized for implementing a successful anti-alcohol diversion program for university students, spearheaded by Detective Bruce Allee. Minor alcohol offenses by students on campus can be addressed through a pre-diversion program which requires students to participate in an impact panel and community service. Michael McClellan, a senior at Roncalli High School in Indianapolis, wants to be a filmmaker. But when he heard about Butler’s first-ever Theatre Day on September 19, he couldn’t resist signing up. Along with over 100 other high school students from Ohio, Illinois, Kentucky and Indiana, McClellan was able to experience a day in the life of a Butler theatre student. He says the one-on-one instruction with professors and college students inspired him to be himself both onstage and off. “They were talking about, ‘We don’t want to see your characters, cause anyone can do a character. We want to see who you are and what you can bring to this college,’” he said. 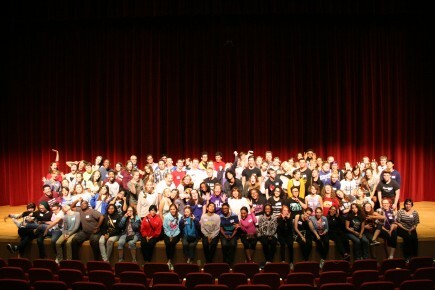 Theatre Day was the brainchild of LaKisha Cooper, an administrative assistant in Butler’s Theatre Department. She dreamed up the idea as a way to expose high school students to the program while allowing Butler’s theatre majors to shine. Theatre major Kristen Gibbs ’18 agrees. 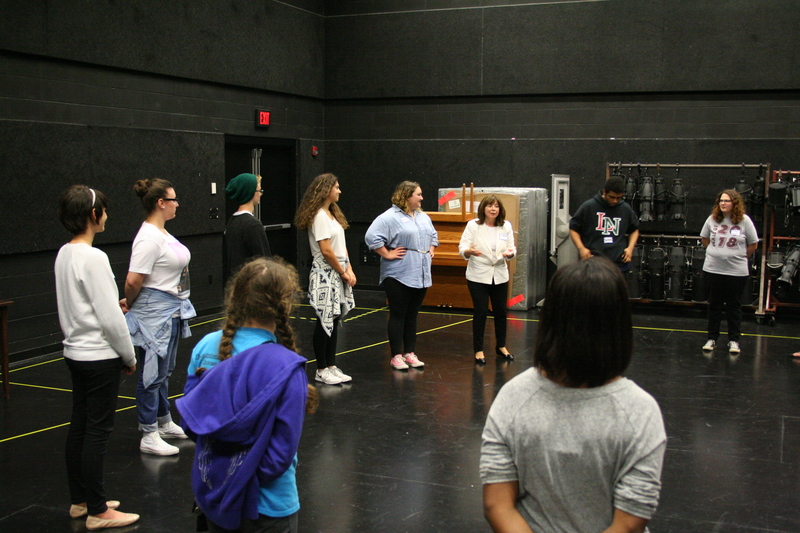 She says the day was the perfect opportunity for high school students to experience actual theatre classes with college professors - an opportunity she wishes she could have had. In a makeup class, students were able to paint each other’s faces like zombies. In an acting class, professor Elaina Artemiev led students through an exercise, and voice, movement and lighting classes completed the lineup. At the end of the day, a few lucky ninth- through 12th-graders were picked out of the crowd to perform their monologues for three professors in a mock “audition” in the Schrott Center. After each performance, students applauded their peers with supportive whoops and cheers. The professors provided instructive criticism and tips for the students to improve their monologues, providing the perfect finale to an educational day. And although the day was jam packed with educational sessions, according to Gibbs and Bridges, the high schoolers’ favorite part of the day wasn’t a particular class or session. Rather, it was waffle day in the cafeteria. On Theatre Day, even Atherton’s a stage. 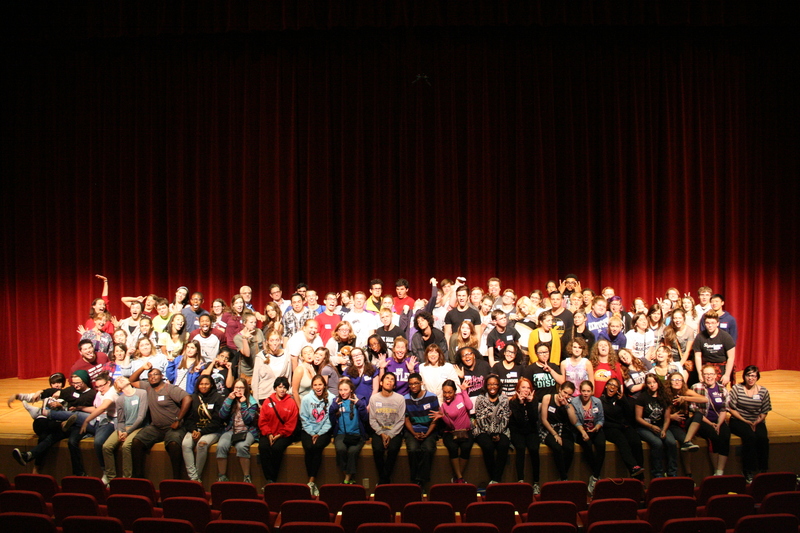 More than 100 students from four states visited Butler for Theatre Day. Forbes magazine contributor James Marshall Crotty came to campus for commencement and filed a story in praise of speaker Eva Kor's "never give up" message and Butler's approach to education. He concluded: "Indeed, as we prepare our students for a tech-driven future, let’s remember the perennial attributes of what made this nation great: service, humility, self-reliance, basic human decency, and a deep remembrance of history chased by the enduring power of forgiveness. Calm, quiet, and humble schools like Butler University are showing us how to model those values every day of our lives." 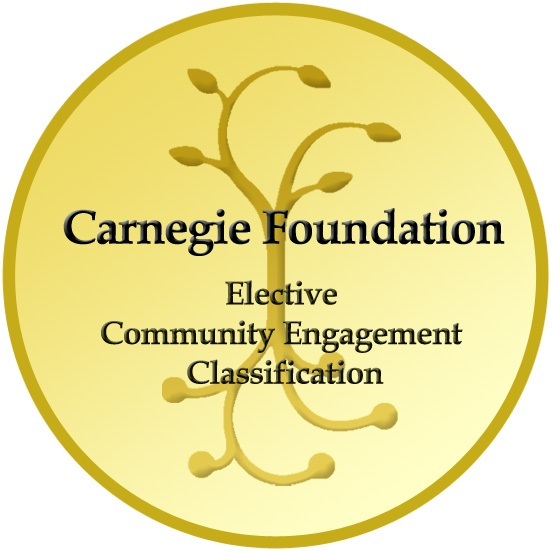 Butler University has been selected to receive the Carnegie Foundation’s 2015 Community Engagement Classification, a distinction that recognizes the University’s efforts to connect with the Indianapolis community. This designation acknowledges the ongoing involvement of college students, staff, faculty, and community partners in working together to improve the quality of life in Central Indiana and beyond. "The classification recognizes our commitment to partnering with communities as we provide experiential learning opportunities,” Butler University President James M. Danko said. “Our students connect with the community, and together we serve the common good." Butler is one of 361 institutions nationwide to receive the Community Engagement Classification—and one of 240 selected for 2015. 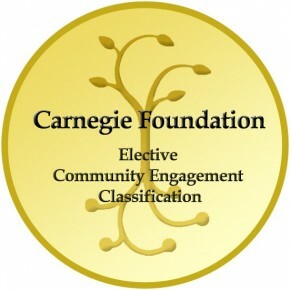 In earning the Carnegie classification, Butler is cited for programs such as its Indianapolis Community Requirement (ICR), a unique component of Butler’s core curriculum through which all students take at least one course that involves active engagement with the Indianapolis community. More about the ICR is here. The Butler-Shortridge partnership, engaging Butler faculty and students in various curricular and programmatic collaborations with Indianapolis Public Schools' Shortridge Magnet High School for Law & Public Policy. The Early College Program, which brings select Shortridge juniors and seniors to campus each semester to earn college credits and contribute to the Butler community. Partnerships with local organizations such as the Martin Luther King Jr. Community Center, The Immigrant Welcome Center, and A Caring Place. The Butler Community Arts School, which provides low- and no-cost music and arts education to hundreds of students across the community. The Community Screening Practicum, through which Butler students in the Communication Sciences and Disorders program conduct speech, language, and hearing screenings for children enrolled in Indianapolis community schools. Generation Rx, a joint effort of Butler Student Association of Pharmacy and students of the College of Pharmacy and Health Sciences that strives to educate and raise awareness about prescription drug misuse. Writing in the Schools, a collaboration between Butler’s Master of Fine Arts in Creative Writing program and Shortridge Magnet High School, has worked directly with more than 300 of Shortridge’s 900 students. The Butler Business Consulting Group, which helps Indiana companies and the Butler College of Business grow by leveraging our depth of experience and breadth of resources in a spirit of teaching, learning and caring. Danko said Butler-Indianapolis connections help students learn about themselves and others, while engaged in meaningful community service.